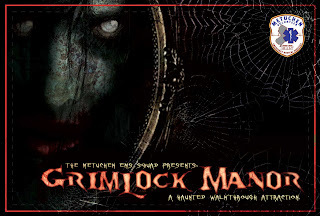 Here is part two of our continued home haunt & haunted attractions on going posts. Today we are featuring the Davis Graveyard. When we first stumbled across the Davis Graveyard online we fell in love with the Tombstones that they had created. They put a great deal of time into their tombstones and the attention to detail is just great. We actually use the same design techniques when building our tombstones. It is a very time consuming process especially when you are trying to fill an entire graveyard so I commend them on a job well done. Davis Graveyard is definitely without a doubt a source of inspiration to us so we hope you enjoy the video and please take the time to check out their website which can be fond in our links section. Here is a quick flyer with some of our information for our event this October if you would like to download the art, hang it in your home or office or even pass them around to your friends! FEARnet Route 666. DC Cemetery. One thing we really want to start doing is posting some videos of other haunts that catch our eye and really make us think about what we can do to make our event better. The first video we are posting is of the D.C Cemetery. We just spoke about them in our last post but please take the time to take a first hand look at the great show the DC puts on and what exactly goes into it all. 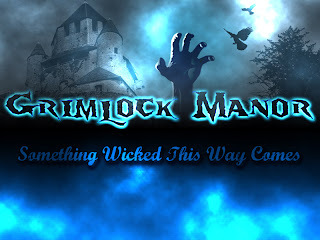 Stay tuned as we continue to post a video a day of all of the haunts that continue to inspire us here at Grimlock Manor! We just got some cool new toys for our haunt today! Our first image is our vintage Underwood Typewriter for our "Study Room." 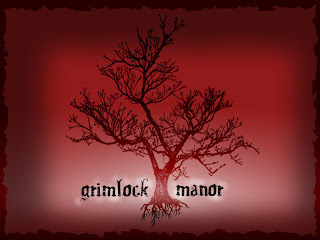 We are trying to obtain a very classic/vintage look for Grimlock Manor. Because the main Character Griswald Grimlock was a world traveler and former archaeologist we felt the Manor should be filled with various vintage items as well as oddities that Mr. Grimlock has collected over the years. The typewriter should fit in nicely to that point. 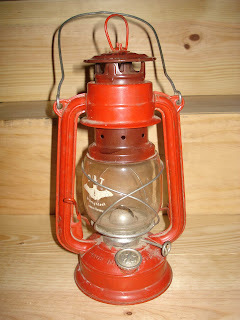 Next up is an old "BAT" lantern. As I understand these were made in Germany and are much older as they use lamp oil with a wick. We will most likely be using this one with our graveyard caretaker character. Finally we come to our cool new toy, a mini air cannon! We will probably be using a few of these in our attraction but we can't tell you were! It's a nice effect and powerful enough to spook the best of them. We have to give credit were credit is due as the cannon was created by the folks at the DC Cemetery. DC Cemetery is a home haunted attraction in Mountain View CA that has a large display during halloween. DC won a contest in 2007 run by FEARnet.com for the scariest home haunted house. While the folks at DC are creating their awesome display they are also busy building some of the same devices they use in their display for other haunts like ours for example. Be sure to check them out and see what other "devious concoctions" they have brewing. New props & Makeup Test pictures! We wanted to take a minute to post a few new progress pictures. We got to work and painted our "Beast" characters prosthetic, you can see the unpainted version in some of our earlier posts. Also, one of our very talented in house artists created this great wall mount taxidermy head of a werewolf. We hope you enjoy the pictures and if you have any questions or comments please be sure to write or comment! Quick post tonight. We have a few desktop wallpapers to share with you so feel free to download away and share! We will be providing more art next week so please be sure to check back here at the same time next week. Here is a first look of Lucilla Grimlock & Griswald Grimlock! Stay tuned for a list of our promotional events that we hope you will come out and meet us as well as Lucilla and Griswald! 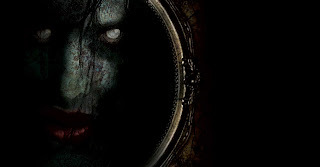 We wanted to take the time to also try and post things that we see on a daily basis that inspire us and give us new ideas and a drive to keep working on making our haunted attraction as detailed and unique as possible. After seeing the Alice in Wonderland Trailer and the way they have designed the characters and environments we just were blown away. Most of us on the Grimlock Manor Crew love Alice in Wonderland and after hearing that it was Tim Burton who would be directing it we new it would have such a unique style and in our opinion he delivered! We hope to obtain the same success at uniquely styled characters unlike any you have ever seen before and will be posting a few first looks of our characters Griswald Grimlock and Lucilla Grimlock right after this post but for now here is the Alice in Wonderland Trailer for your enjoyment! We thought we would post some pictures from a small workshop we had tonight as we built some props, carved some tombstone and started on some tests with our facial prosthetics for some of our characters. This year we will have over 50+ headstones of various shapes and sizes not to mention very large scaled Ruins, Archways and columns that make up the Grimlock Family Graveyard which is our second featured attraction! 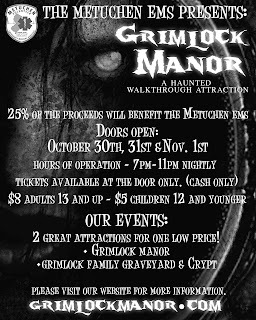 You will be led through our extravagant graveyard by the graveyards groundskeeper who will highlight various points of interest in our graveyard such as the old bottomless well, the archway of unrest and the famous Grimlock Family Crypt that until now hasn't been open in years. Hopefully you will be brave enough to enter the crypt...did we mention your only light source will be a glowstick?! We hope you enjoy these pictures. We will continue to post updates and display a few of our props upon completion, please feel free to ask questions or just say hello. Pre-production pics. Begining stages of design. 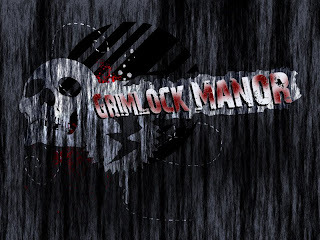 Well it's been awhile since our last post so please let us apologize for that but we have a lot of new and exciting news to share and a lot of new photos to be added so I hope that you will be as excited as we are with what has been taking place at Grimlock Manor these past few months. Griswald Grimlock Himself will be posting weekly journal entries as we lead up to our event so please feel free to follow along with the story line. We are also posting update pictures, sneak peeks and calendar events on our Facebook page as we continue to move forward and remember, if you like anything then please remember to leave us feedback as we love to hear from you! Next up is our promotional events. Our first event that you can come out to and meet us is the August 5th Classic Car Cruise Night in Metuchen NJ on Main Street in Metuchen. We will be there handing out our flyers at the Metuchen EMS Squads booth. There will be a free ticket giveaway so please be sure to stop by for your chance to win! We will be publishing a new post with all of our event dates soon. Website updates. Our website is currently being overhauled to feature all of our dates, times, faq and fun media that we have been working on these past 2 months so we will be sure to leave a BIG announcement when it is fully complete. Finally, new pictures and media. 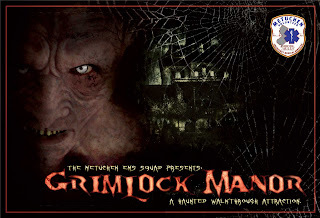 We will be posting shortly some new sneak peeks of our characters, scenes and our first movie trailer of our attraction ASAP but to wet your appetite here is one of our main characters that you will meet when you come to Grimlock Manor this October 30th, 31st and November 1st!! $8 Adults 13 and up & $5 Kids 12 and under.